A work of art in its own right. Princes of Florence is a “Eurogame” played in seven round for 3-5 players that centers around the theme of supporting artisans during the Renaissance. 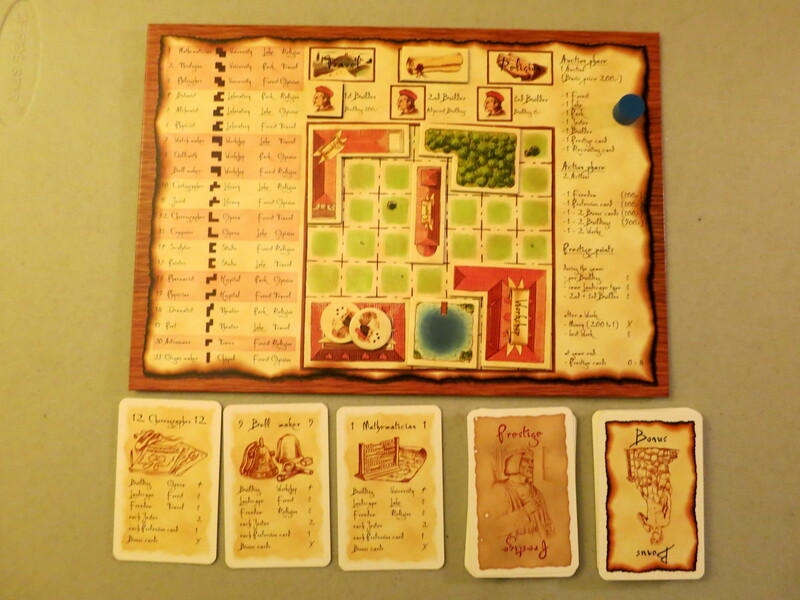 It combines bidding, resource management and other common elements into a unique, wonderful strategic game. It has long been my favorite and I find it holds up beautifully years after I first played. It can seem a bit overwhelming at first. There are a lot of components and rules and it is necessary to give new players some instruction before beginning. Once that’s done and the game begins, however, most find it easy to pick up. Getting a feel for strategy and planning will likely take a few games. The goal is to have the most prestige points (victory points) by the end of the game. The primary method of scoring prestige points is by playing one of the 23 artisan cards to complete a “work.” The value of the work will depend on whether or not you have things in your principality (play area) that inspire the artisan. For example, playing a Mathematician is worth more if you have a University. Each artisan prefers 1 of 10 available buildings, 1 of 3 available landscapes and 1 of 3 available freedoms. Balancing which of these, and of other benefits and modifiers, you acquire is the key to victory. There are also placement and monetary restrictions to consider. I won’t get into to too much more detail, but the structure of each round is another key to the game and warrants discussion. 1) Auction phase: Seven things (the three landscapes, jesters, builders, cards worth extra prestige at the end of the game and cards that let you use previously used artisans) are ONLY available via auction. Bidding always starts at 200 florin and increases in increments of exactly 100 until all players pass. The last bidder now gets their choice of anything that hasn’t been already claimed that round. This continues until every player has obtain exactly one auctionable item. The bidding element combined with only being able to obtain one of these things per round adds great layers of balance and strategy to the game. 2) Action phase: Each player takes up to two actions. You can buy a freedom, buy a new artisan, buy a card to add bonus value when you complete a work, buy a building, or complete a work. Careful use of your two actions, management of available cash and exploiting what you acquired during the auction will pay off greatly. The game comes with two player rule modifications and a packed in expansion of six special character cards. These give special abilities (such as getting a free auction item) and are auctioned off in a special phase at different points in the game. I enjoy the base game so much (and never have just two people for gaming) that we have never tried either of these modifications, so I can’t comment on it’s execution or balance. 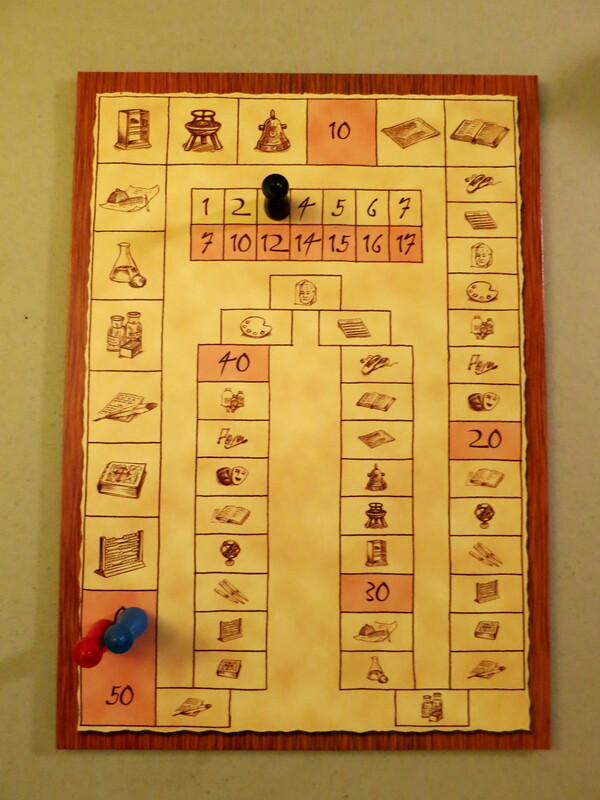 The individual player game boards and other game components are all of good quality and hold up well over time. Princes of Florence has a lot going on but it is all wonderfully constructed and well balanced. I adore the way everything comes together. Even the auction element, which I generally dislike in games, is incorporated perfectly and adds strategy without slowing things down. There are several viable ways to enhance your chances of completing works and scoring points, and the availability of things based on your opponent’s action makes every game different. While I wouldn’t use it to introduce people to Eurogames, Princes of Florence is easily my personal favorite and I’d highly recommend it for any Eurogamer’s closet.